Small kitchen appliances like toaster ovens, food processors and juicers can save time and energy in the kitchen. 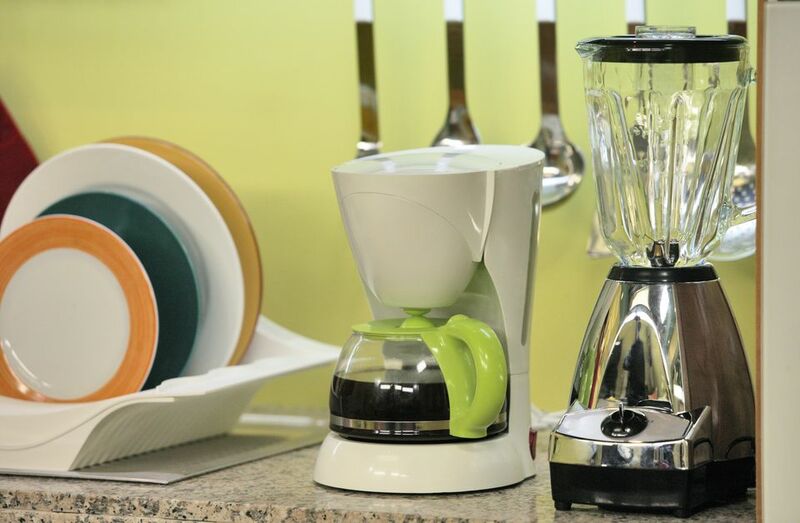 And we all know that a coffee maker is practically a must-have for a caffeine-craving household. Take a look around your kitchen–are all those appliances really clean and bacteria free? Nearly every small appliance has some type of control panel or handle that is touched every time it's used, leaving body soil and bacteria like Salmonella, Listeria, E. coli, plus mold and yeast. And what about what's happening inside the appliance where food and beverages are processed? Any of these organisms can cause digestive upset or worse. Whether you use a drip coffee maker, French press, fancy espresso machine, or a single pod coffee maker, it should be cleaned regularly for both good tasting coffee and to prevent bacteria growth. Coffee makers combine moisture and warmth, perfect breeding grounds for bacteria and mold growth. 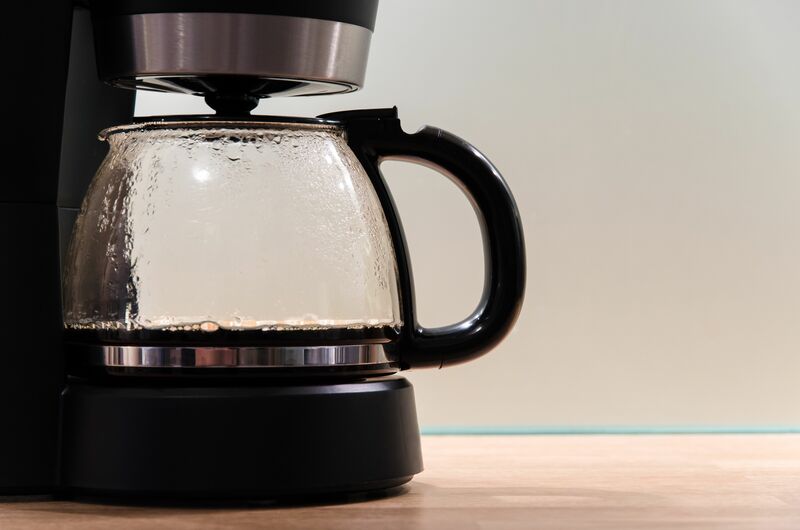 For the best tasting (and safest) coffee, all removable parts of the coffee maker should be removed after every use to clean away coffee grounds and oils. The parts can be hand washed with warm, soapy water or placed in the top rack of the dishwasher. Empty water reservoirs and drip trays and take a moment to wipe down the outside of the maker and warming plates with a clean damp cloth. The reservoir lid should be left open between every use so the area can thoroughly dry out. Unless you use distilled water every single time, eventually minerals from tap water can build up in the machine. Cleaning those away is simple. Just fill the reservoir with equal parts distilled white vinegar and distilled water. Allow the solution to sit in the coffee maker for at least 30 minutes–one hour is better–and then run a brewing cycle. Next, run two full brewing cycles with just plain distilled water and you will have a clean coffee maker that's ready to make great coffee. If you've ever used a blender, food processor or juicer, you know all about the splatters of food and liquid that can go everywhere, especially if you forget to use the lid. Fortunately, these appliances are easy to clean because they can do most of the work. After every use, rinse out the blender or juicer cup with plain water. Then fill half full with warm water and a drop or two of dishwashing liquid. Give it all a whirl for 15 to 30 seconds. Pour the solution over the lid as you empty the cup in the sink. Finally, disassemble the appliance blades and lid parts. Rinse well in hot water and allow to air dry completely before reassembling. Finally, unplug the machine and wipe down the outside of the base with a clean cloth. For hard-to-reach spaces between buttons or knobs, use a clean, soft toothbrush dipped in a solution of warm water and a drop of dishwashing liquid to remove particles. Wipe down with a clean cloth dipped in plain water and allow to air dry. Part of the appeal of an electric grill or panini press is the nonstick surface. So cleaning it properly will not only prevent cross-contamination from food bacteria; but will preserve the finish for years to come. Immediately after using, unplug the appliance. Wet several paper towels and use metal tongs to hold them as you wipe down the hot grill or press to loosen food particles. When the appliance is completely cool, mix one cup of warm water with a drop or two of dishwashing liquid to dampen a clean, soft cloth. Use the cloth to wipe the entire cooking surface and any outside surfaces. If there is an excessive buildup of grease, use a clean soft toothbrush to get into crevices. NEVER use a scrubbing pad or sharp tool on the nonstick surface. Rinse with another cloth dipped in plain water, then dry with a soft cloth. For grills or presses with removable plates and drip trays, wash in hot, soapy water or place in the dishwasher if recommended by the manufacturer. Splatters happen. The easiest way to clean the inside of a microwave is to let it do the work. Fill a microwave safe container with at least one cup water. Process until the water is at roiling boil; then turn off the microwave. Keep the door closed for at least 15 minutes. The steam will loosen food particles and make them easy to wipe away with no scrubbing needed. To finish the job, use a soft cloth dipped in one part distilled white vinegar and one part warm water and wipe down all interior surfaces. Hand wash or place the glass turntable, if you have one, in the dishwasher. Wipe down the outside handles and keypad with a disinfecting wipe to remove bacteria. If you have a combination microwave and range hood vent mounted over your stovetop, don't forget to clean the hood and filter regularly to remove greasy residue. A portable or stand mixer is nearly an essential if you prepare food often. The danger comes if food particles get caught in the blades or beaters. You can fill a bowl with warm water and a drop or two of dishwashing liquid and turn on the mixer for 15 seconds to loosen food. But the safest way to clean the mixers is to disassemble and hand wash non-electrical components in hot soapy water or place them–as recommended by the manufacturer–in the dishwasher. Crumbs and built-up grease can cause fires; so it's important to clean toaster ovens and slice toasters frequently. After every use, unplug the appliances and open trap doors or shake it upside down over the sink or trash can to remove loose crumbs. For toaster ovens, wash the removable tray or toasting rack in hot soapy water, rinse and air dry after every use. At least weekly, unplug the appliance and use a soft cloth dipped in hot, soapy water to wipe down the interior and exterior avoiding the heating elements. Use a clean soft toothbrush to reach any tight crevices. Rinse with a cloth dipped in plain water and allow to air dry at least 10 minutes before using. Many electric can openers have a blade that frequently touches the contents of the can. Cross contamination is always a danger so cleaning after every use is best. Unplug the appliance and use a clean cloth dipped in warm soapy water to wipe down the blade and casing. NEVER immerse the whole appliance in water. Every few months, remove the cutting mechanism and wash in hot soapy water. Use a toothbrush to remove food particles from tight crevices. Rinse and air dry completely before reassembling.